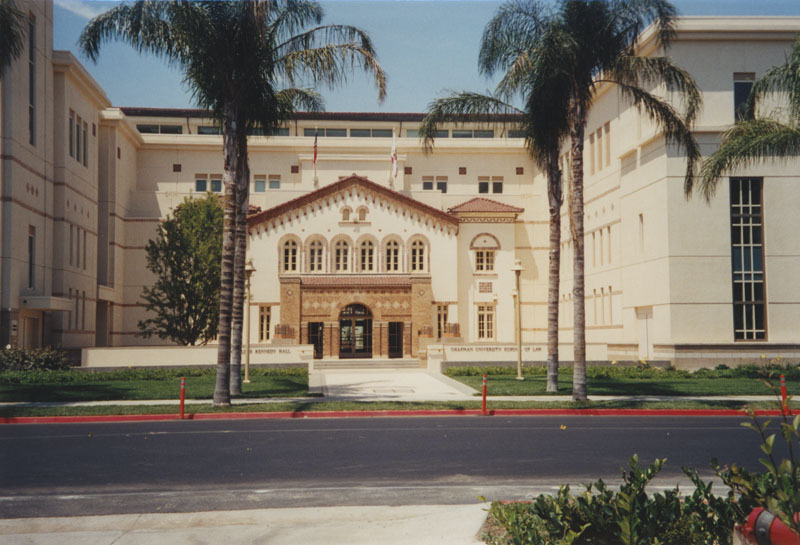 The Chapman University School of Law offers a full-time program leading to the Juris Doctor degree. In addition, the School of Law offers a joint JD/MBA degree with Chapman's AACSB-accredited Argyros School of Business and Economics. The required curriculum offers a core foundation in legal studies and covers foundational topics such as torts, contracts, criminal law, real property, civil procedure, legal research and writing. The required curriculum also grounds students in corporations and federal income taxation, constitutional law, evidence and professional responsibility. As a student, you are also required to take part in the lawyering skills curriculum. Skills training is the practical, experiential component of your education, where you begin to acquire the skills essential to the practice of law. In these courses you will have the chance to gain competency in negotiations, client interviewing and counseling, mediation, advanced legal research, advocacy, appellate practices and procedures, legal drafting, and trial practice. The advanced curriculum will provide you the opportunity to take electives that help integrate your legal knowledge and lawyering skills to solve client problems. Explore the additional clinics, emphases, externships and competitions you can add to your law degree experience. At a GlanceChapman University School of Law offers a collaborative, rigorous, and personalized legal education. Graduates develop the skills to provide passionate, ethical and accurate service to their clients and to society. With one of the best faculty/student ratios among American law schools, Chapman offers smaller class sizes and greater access to faculty both in and out of the classroom. Chapman provides practical training through a variety of clinical programs and externships, as well opportunities for students to participate on legal journals and award-winning competition teams. Chapman has a dedicated staff to help its graduating students obtain positions of responsibility in the legal workforce. Chapman is ABA accredited and a member of the Association of American Law Schools. Description: An advanced, professional study of the law, policies, and regulations related to copyrights, patents, trademarks, trade secrets, and related issues. Includes instruction in patent law, copyright law, trademark law, intellectual property licensing and litigation, and applications such as art and entertainment law, communications law, information technology law, sports law, and chemical and biotech patent law. Description: An advanced, professional study of tax law and taxation procedures in U.S. or Canadian jurisdictions affecting individuals and corporations. Description: Any program in legal research and advanced professional studies not listed above. Description: An advanced, professional study of the law affecting relations between nations, the behavior of international organizations, and the international activities of private citizens and organizations. Want more info about Chapman University School of Law? Get free advice from education experts and Noodle community members.